This irc server is similar to cmjc.whhcd.info in that is it is a shared server where many different skiides can host their irc nets. This one is hosted exclusively for the owners of the barracuda .net ircbot by the coder of the bot. This can be useful as you can pull the coder into the channel when all of your bots die. <xxploasion> after a reboot of what? <xxploasion> my stuff or their cpu? <xxploasion> what is the issue? <xxploasion> ohh and if i don't have a miner that has mutex. should i just run the botkiller every time so that i don't double down on the bots? <xxploasion> wati huh? and do i have to send that to my bots now? 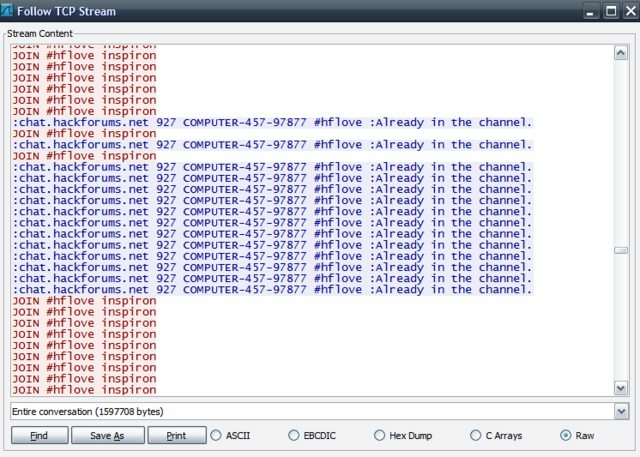 All your bots will probably die quite often, as barracuda is the latest piece of .net malware to come out of hackforums. It surpasses the usual .net creations in terribleness by requiring a .net version higher than the standard 2.0 to run. While googling the domain out of curiosity, I found a deleted pastebin post. After recovering it through google cache, I discovered that it was an incomplete ircd config for the server. I’ve taken the liberty of re-uploading it here. <Tropical> All activity is logged. <Tropical> All activity in this channel is logged. <Tropical> This is a setup. <Tropical> And what the hell are you doing here? <Tropical> I know where you came from. <COMPUTER-457-73875> this bot is coded in .NET? <Tropical> PM me on HF if you're there. I mainly post to annoy skids. Also it's funny to watch people try and use them.